Personal Injury Category Archives — New Jersey Divorce Lawyer Blog Published by New Jersey Divorce Lawyers — Aretsky Law Group, P.C. We are pleased to announce that our Managing Partner, Eric J. Aretsky, Esq. 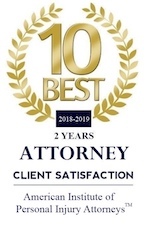 has been selected by the American Institute of Personal Injury Attorneys (AIOPIA) as a 10 Best Personal Injury Attorney in New Jersey. Mr. Aretsky is devoted to fighting for the monetary compensation that accident victims deserve for their injuries. STEP 1: The Attorney must be nominated by the Institute, Client, and/or Peer. Personal injury law in New Jersey can be defined as any bodily injury or emotional distress a person suffers. When that harm is caused in whole or part by another party’s negligent, careless, reckless, or intentional behavior, then the injured party may be entitled to collect compensation. In order to learn more about your rights and what you can do to protect those rights, it is important that you understand some basic facts about personal injury law in New Jersey. Personal injury law is a branch of civil law that deals with legal disputes that arise when one party, the plaintiff, holds another party, the defendant, responsible for harm suffered as a result of an accident. In order to receive compensation, or damages, from the defendant, the plaintiff must prove that the defendant was, in fact, at fault. On August 28, 2018 the Mahwah, NJ Police Department disclosed that earlier this month on Route 17 North a truck carrying candy overturned as the result of a road rage incident. The tractor trailer flipped on its side after the driver of an SUV cut in front of the truck to slow it down because he thought the truck was being operated recklessly. As reported in the Bergen Record, which includes video of the crash captured on a dash cam of a driver behind the accident, the police posted news of this event in advance of the Labor Day holiday weekend to warn drivers of the hazards of overly aggressive driving. Fortunately, neither driver was seriously injured in the accident. The driver of the truck alleged that the driver of the SUV hit his brakes while changing lanes causing him to lose control of the tractor trailer. Both drivers were issued traffic tickets for failure to signal, failure to maintain lane and careless driving. The driver of the SUV also was written up for delaying traffic. Slip-and-fall accidents are very common. Luckily, in most cases, the injuries are minor. However, this is not always the case. If you or a loved one has suffered a serious injury or death as the result of a New Jersey slip-and-fall accident, you might be eligible to recover damages. If you believe that the accident was due to the negligence of another party, it is important that you seek the advice of a knowledgeable New Jersey slip-and-fall attorney who will use their expertise to analyze your case and let you know whether or not it would be worth your while to pursue a lawsuit.